Brett Mallory Miles - Haig Barrett, Inc.
Brett is known for Empowering Leadership™ through his management consulting, strategic thinking, meeting facilitation skills, executive coaching and executive team building. 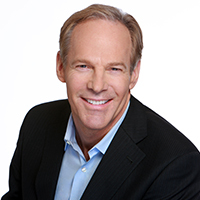 Brett has Fortune 500 sales, management and leadership experience in the business services and technology sectors with Yahoo’s Resumix, Inc., Oracle Corp., Lockheed’s CalComp, Control Data Corporation, and the United States Army where he served as a Captain. Brett’s experience and leadership span sports, board-level, sales teams, company, and management consulting projects. He works within a variety of industries especially Entertainment, Technology, Automotive, Finance, Consumer Products, Manufacturing, Services, and Commercial Real Estate. Brett is a certified through the International Coaching Federation and Fielding Graduate University’s Evidence Based Coaching Master’s level program. He is certified in Marshall Goldsmith’s Stakeholder-Centered Coaching. He was trained in Ontological Coaching by Fernando Flores, PhD. He is certified in a variety of assessment areas that include behaviors, motivators, thinking acumen, competencies, emotional intelligence (EQ), ASSESS® 360 surveys, and FIRO-B.